CAN A PERFECT LOVE SURVIVE A LIFETIME BETWEEN TWO IMPERFECT PEOPLE? 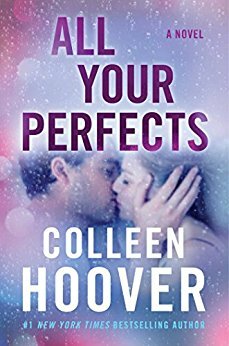 I just have to say while All Your Perfects by Colleen Hoover was perfect it was also sad and depressing too. It took a lot to get through it but I’m glad I did because I got a little something out of it. What a roller coaster of emotion! I loved it and I hated it. Simply that. The highs made me feel the giddiness of falling in love. The joy you have just looking into his eyes, the promise of the perfect future. The lows made me cringe. I loathed these parts of the book. I struggled to turn each page while tears slipped down my face. They were each needed. The love and the hate. The highs and the lows. Each page pushed us towards the not so perfect love in this story. Thank you Colleen. Thank you for the escape, for the joy and the heartache. Thank you for making me take a second look at my life and reminding me to let my perfects shine.